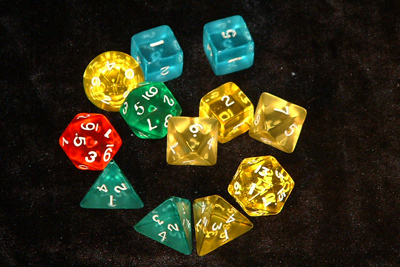 Solid four, six, eight, ten, twelve and twenty sided dice. 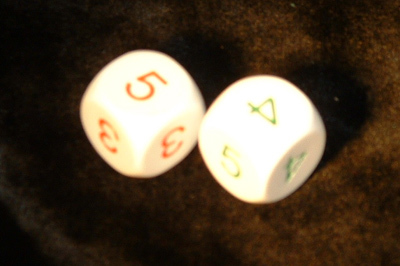 Large Dice (regular red six sided dice for comparison). Small and tiny dice including glitter dice. 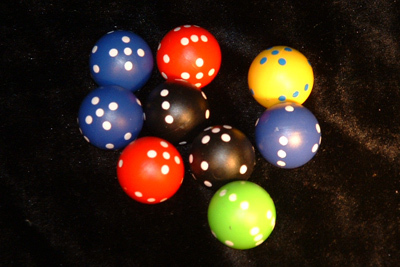 Novelty spherical dice numbered one to six. 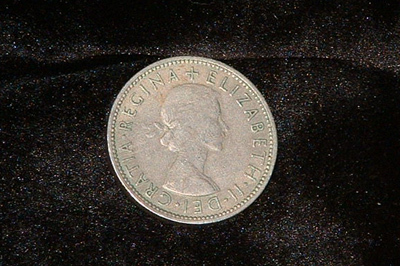 A 2 side die (otherwise known as an old 10p coin before they went small and unsatisfying to flip). 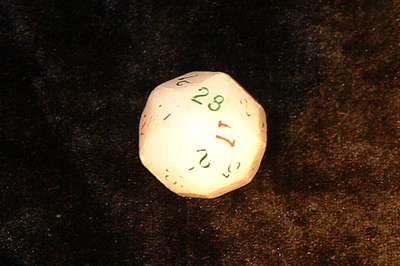 A thirty sided die that glows in the dark and has numbers you have to fill in with crayon to read. This is the die with the single largest range of numbers I own although you can get them numbered 1 to 100. 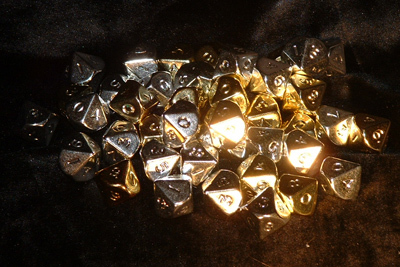 Silver and gold metalic effect dice. A direction die N, NE, E, SE, S, SW, W and NW. 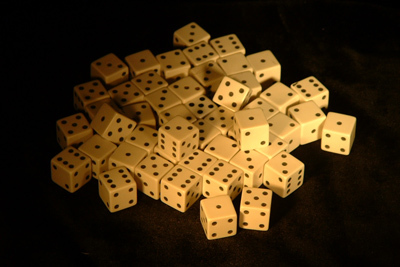 Lots of simple, old fashioned, six sided dice in white plastic. Whoa - never knew there were so many kinds! That's really neat, especially the 100-sided die! I should buy some gold ones for my DH's Christmas stocking! Cool TT - love the pics!!! 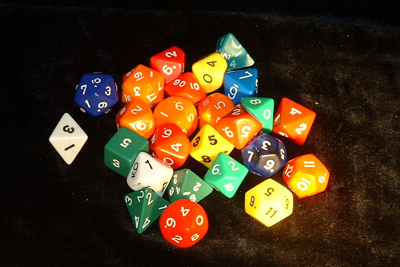 Wow, I didn't know there are so many different dice! They look great though! Very cool TT, my faves are the metallic ones. Ohhh I love the metal ones!!! We've got a 100 sided one. ;) It keeps rolling and rolling but eventually it gives you a number :D My favorite is my ten sided glow in the dark die. 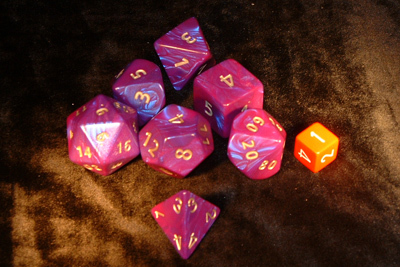 :D Someday I will find a full d20 set in pink though! Sparkley would be ideal! What a collection! Hmmm, I think I still have some of the old 10p's hanging around - heavy and feels like money unlike the new which belongs in a Monopoly game. "loaded" meaning usually weighted to favour the 6? 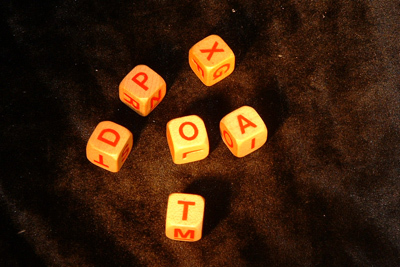 Loved the wooden alphabet and emotion dice. Didn't know there were so many different versions out there. Who knew? What a great collection. I recognize the multi-sided from playing Dungeons and Dragons back in highschool. wow ... fascinating collection! never knew there were lots of them! Wow! That's a whole lotta dice! I have a very lovely scar on my forehead from one of the many sided ones. (It was a scattergories dice and it had letters on it...still hurt just the same though!) Have a great weekend! You brought back some fond D&D memories. Happy T13. 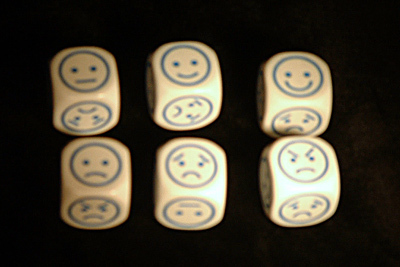 The dice featured in #7 are pretty cool. I actually have a few of the others because I'm a board game fanatic. I've got a number of those, guess I must be a game nerd too! 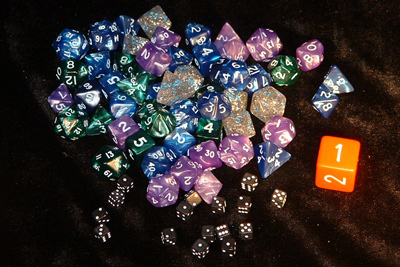 Who knew there were so many types of dice? Can you actually use the round ones?